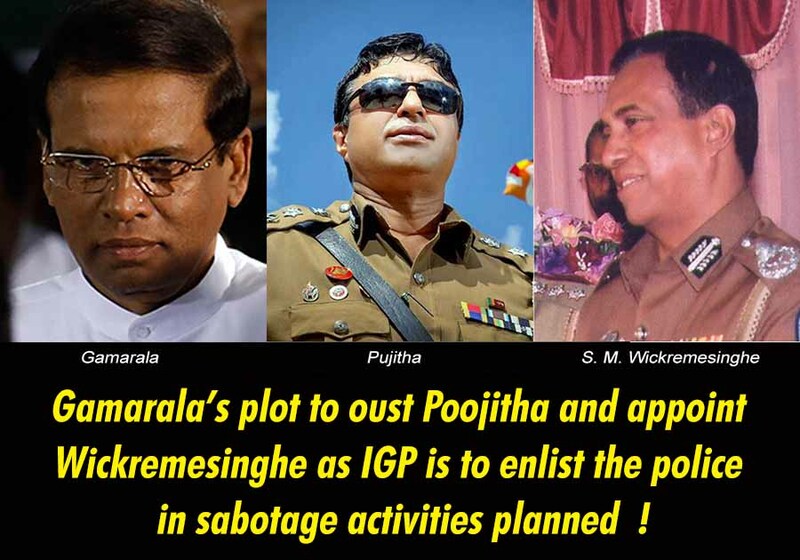 LEN - www.lankaenews.com | Gamarala’s plot to oust Poojitha and appoint Wickremesinghe as IGP is to enlist the police in sabotage activities planned ! (Lanka e News – 07.Jume.2018, 10.50PM) While the present government is comprised of the UNF in a majority and a minority SLFP , the president Gamarala has hatched a plot to oust the present IGP Poojitha Jayasundara and replace him with S.M. Wickremesinghe DIG who is his stooge. This is with the aim of destroying the faith the people have on the UNF and government , and to alienate the masses , after taking out the SLFP minority group in the government to form an alliance with the group led by Mahnda Rajapakse. The replacement move of Gamarala is to enlist the police with a view to facilitate the massive sabotage and disruptive activities to be staged during the next two months . To accomplish this goal , it was a statement made by IGP Poojitha without naming anyone that was used as a pretext ( LeN along with the video footage published this on the 6 th in Sinhala edition) . What Poojitha said was , an individual who is within an excreta pit is condemning a passer by on whom a drop of urine is stuck .This was construed by Gamarala as an insinuation made against him . Gamarala after wearing the cap which was not meant for him but because it fitted him anyway is getting ready to slit the throat of Poojitha. President Gamarala with this objective in view had summoned a group of UNF ministers including minister of law and order Ranjith Madduma Bandara on the 5 th night , and told them Poojitha shall be ousted from the IGP post , and therefore to extend assistance towards that. In addition he had summoned the IGP and scolded him most insolently. After the introduction of the 19 th amendment which divested the president of powers in this connection , an IGP is appointed by the president on the recommendations of the Constitutional council. If the IGP does not resign , he can be removed after tabling a resolution in parliament pinpointing his lapses and getting it passed on a simple majority. Otherwise than that the president cannot oust or appoint an IGP whimsically. This law was introduced to extricate the police force from politicization. What Gamarala is seeking now is , use all his overriding evil traits in order to resume his despotic powers and chase away the IGP while turning his back on the most sought after democracy for which the masses voted on 2015-01-08 , as well as reject the 19 th amendment which is an intimate and integral part of that. The IGP may have his faults , but under no circumstances can the effort of the president be condoned or allowed which aims at dismissing the IGP merely to gratify the president’s personal whims while invoking his previous powers which had now been withdrawn,. It is because if that is permitted even the small avenue of Democracy which was opened by trimming president’s powers with great difficulty will get closed. If the president is allowed to have his way ,that can create a most pernicious precedent in the future.. Though LeN criticized Poojitha then and nicknamed him Police Koloma , at this crucial juncture he must be safeguarded because at present , he is sought to be ousted not due to his faults but because of countless faults of president Gamarala. President Gamarala who is by now confirmed as afflicted with a mental disorder is moving no stone unturned to appoint Wickremesinghe who accompanies Gamarala in latter’s vulgar secret tours playing the role of a pimp. It cannot be forgotten Wickremesinghe was one of those who made a major contribution to fan the flames of communal violence in Kandy in the recent past. Lanka e News was the first to expose how this ‘pimp’ allowed the violence to escalate deliberately without giving orders to control it . In connection with the misconduct of this pimp in the Kandy violence , two investigations are under way against him. One is by special investigation unit (SIU) of the police, and the other is by the Human rights Commission, and until now he has not been exonerated of the grievous charges. The eagerness of Gamarala to chase out Poojitha and replace him with Wickremesinghe as swiftly as possible is because of the sabotage activities which are to be staged conjointly with the Rajapakses in another two months, that is to enlist the necessary assistance of the police in that connection. We are exposing these diabolic plans and aims taking absolute responsibility. We are stating this so confidently because we are fully aware , by now discussions had been held between Pallewatte Gamarala and Mahinda Rajapakse in this connection , and it is Maithri Gunaratne’s father Herman Gunaratne who is acting as the intermediary ( we shall by another report furnish these details) . It is the incumbent duty of not only the UNP , but even all other Democratic loving parties and civil organization leaders to join together to defeat the most deadly conspiracy of embattled president Gamarala, now a name synonymous with betrayal, ingratitude and treason.